I hope to encourage you with these words; YOU ARE UNTOUCHABLE. God said in Hosea 4:6 that “My people are destroyed for lack of knowledge.” Notice He didn’t say my people are destroyed because of Satan and his demons. He said “…for lack of knowledge.” Friend, if you don’t know who you are, then you will act or live your life like anybody. It is time to change your thinking, if you have not. The scripture say “God’s Son holds them securely, and the evil one cannot touch them.” (1 John 5:18 NLT). The “them” in this passage refers to God’s Children. 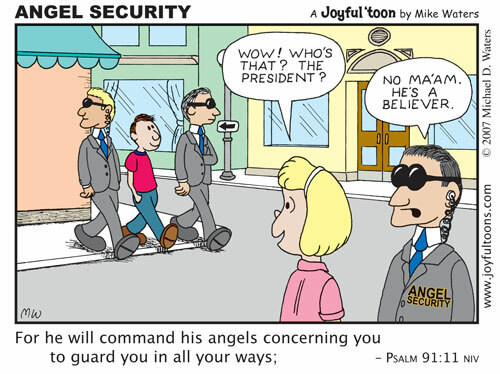 In other words, Jesus holds God’s children securely, and the evil one cannot touch them. Let’s not forget that Satan is the evil one. If yes, then you are untouchable because Jesus is protecting you 24/7. Do you know that nations of the world spend billions of dollars protecting their citizens yet they fail to achieve that? Don’t think, for once, that you are safe because of National security or because you live in a secured environment. The truth is you are safe because of Jesus. Hallelujah! Jesus in God and you are in Jesus, and Jesus is in you. Thus the enemy has to defeat God, and then defeat Jesus before he can attack you. This is mission impossible for the devil that is why he tries to get you out of Jesus before he attacks. He knows that if he could make you believe his lies, his job will be easy as you would be living in fear instead of Faith. Friend you are protected as long as you remain in Jesus Christ. How do you remain in Jesus? You remain in Jesus when you believe that He is the Son of God, receive him as your Lord and Savior, and do what he has commanded you to do. Don’t act like the rest of the world. When it is not your time to die, the enemy cannot kill you. Jesus died to save you from sicknesses and diseases. You are healed by his stripes. He took all your pains and sorrows, and nailed them to the cross. The Lord comes closer to you when your heart is broken. You are God’s child and the enemy cannot touch you. As you live your day, know that Jesus holds you securely, and the evil one cannot touch you. Praise the Lord forevermore! Next My Little Story: Jesus Saves! This morning God was saying we are untouchable, we are hid in Jesus who is hid in God.